Stage 11 promises to be a day for the breakaway to lay claim upon stage honours, after yesterday’s individual time trial was dominated by Tom Dumoulin in monstrous fashion, as he sailed into a potentially race deciding time gap over Nairo Quintana. 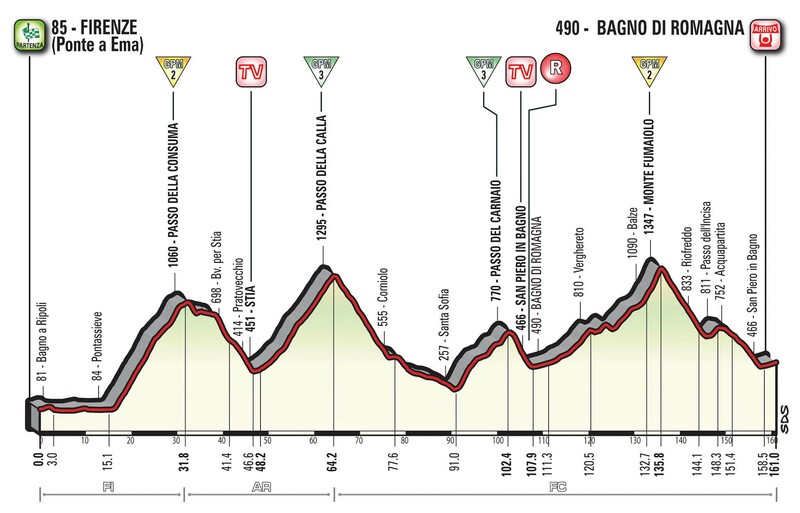 Starting in Firenze, the day just about delivers 15km of flat riding before the roads tilt skywards for the majority of Stage 11, beginning with the Category 2 Passo della Consuma which lasts 15.9 km (avg 6.1% max 10%) before dropping down to the foot of the Category 3 Passo della Calla (16km avg 5.3% max 9%). A long downhill section then follows, before sending the riders up the 11.4km Category 3 Passo del Carnale (avg 4.5% max 11%) and the longer 23.1km Monte Fumaiole, averaging a tame 3.7% average with maximum gradients of 12%. The road then rapidly falls away, leaving the frontrunners to hurtle into the finale at Bagno di Romagna after 161km of racing. The shorter overall distance and high probability of a breakaway surviving the day is bound to make the opening hour of racing frenzied, making the first couple of ascents even tougher than they look on paper. Omar Fraile has yet to truly cash in on the form which we saw from him during this year’s Tour of Yorkshire and could choose today as a good opportunity to do so, if able to make the cut on the opening climb. Though this is not a perfect fit for Fraile, it cannot be forgotten that he won the mountains classification at last year’s La Vuelta a España, so is talented when it comes to hunting the right move to join on a day built for the break. He has the strength to succeed on Stage 11, but the biggest question mark hangs above his ability to make it into the right attack. Mikel Landa shall be another of Team Sky’s options to salvage their appearance at the Giro d’Italia in the wake of their general classification ambitions taking a heavy blow. The Spaniard loves a long range attack, so may well be allowed off the leash to try his luck once again in the breakaway, hopefully chalking up the team’s first win at the race. The testing start will play into his hands, even if the rest of the day is not ideal, while he will need to attack solo over the final summit if he is to take the win; Landa not known for his sprinting abilities after all. Pierre Rolland is likely to have glanced over the day’s profile as a chance for stage honours, with the length of the climbs hopefully dispatching the quicker rivals who may finish alongside him. The Frenchman has already been combative, but was not able to help deliver Cannondale – Drapac their first WorldTour victory since 2015’s Giro d’Italia. He will want to go it alone in the latter stages, but the climb to Monte Fumaiole might not prove tough enough to allow that. Rui Costa may have once held ambitions of producing a convincing general classification campaign at 2017’s Giro d’Italia, yet will now realise that his best bet for glory is to try and join the day’s breakaway on stages like today. The terrain should not prove too difficult for Costa, while his descending abilities will allow him to conserve a degree of energy, if able to bridge back to more talented climbers during some of the climbs. He will hope for a sprint finish at the end, as few others likely to work alongside him all day, possess an acceleration able to match the former world champion rider. Adam Yates could still be focused upon climbing his way up the general classification, but if the race is close to coming back together on the final climb, he has all the skills required to attack over the summit and rapidly descend his way to a stage victory. A fast finishing rider too, if an unexpectedly strong group of general classification contenders end up deciding the day’s outcome, it is also likely that Yates will be the fastest present from that scenario. Valerio Conti was struck by misfortune when crashing within the final kilometre of Stage 8, having produced a brilliant display of strength as part of the day’s main breakaway. The incident is bound to have stoked the fires of the Italian rider, eager to overturn his bad luck and aim to conjure up another brilliant effort to be in with a chance of victory in Bagno di Romagna. Luis Leon Sanchez is an interesting prospect who could be motived by either the mountains classification points on offer here, or the prospect of a group making it all the way to the finish, from which he is almost guaranteed to be the fastest sprinter present. He will no doubt be curious to see who may join the moves, potentially forcing him into action, assuming that Sanchez realises he now has a chance of collecting a jersey in Milano. The mix of riders who have a chance here is broad and essentially a lottery, keep an eye upon the likes of Alberto Losada, Matej Mohoric, Daniel Teklehaimanot, Kenny Elissonde, Tom-Jelte Slagter, José Gonçalves and Hugh Carthy. Posted on May 16, 2017 by Spokenforks	This entry was posted in Giro d'Italia 2017, News and tagged Adam Yates, Alberto Losada, Bagno di Romagna, Daniel Teklehaimanot, Firenze, Giro, Giro d'Italia, Giro d'Italia 2017, Giro d'Italia 2017 Stage 11 Preview, Hugh Carthy, Jose Goncalves, Kenny Elissonde, Luis Leon Sanchez, Matej Mohoric, Mikel Landa, Omar Fraile, Pierre Rolland, Rui Costa, Tom Jelte-Slagter, Valerio Conti. Bookmark the permalink.